There are so many places you can go for Maternity Photographers in Massachusetts. The Mall will happily stand and do a very simple portrait on seamless paper. 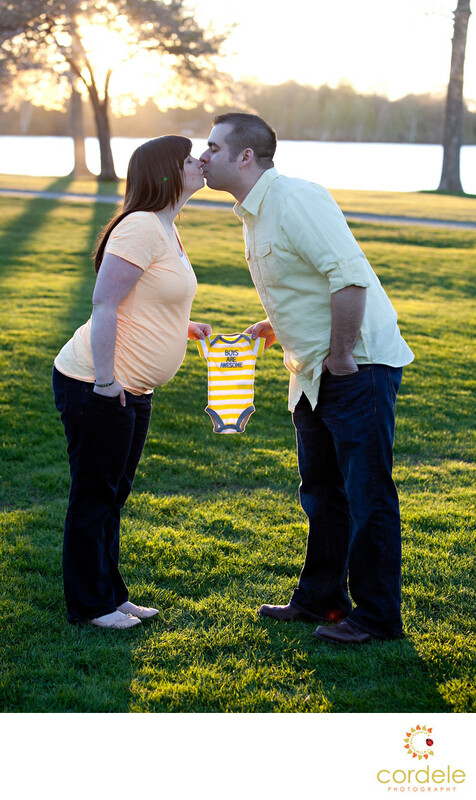 What you need are some portraits photographs of you and your spouse before the baby comes. A lot of my couples aren't sure why they should do maternity photos, but its to remember a time when you looked beautiful and life was about to change! Its a milestone. You can do these photos in studio or outside on location. Here we did photos in Wakefield. A couple stands on the bank of the Wakefield Lake holding a onesie of their soon to be baby boy. This photo is one of my most pinned and used photos for maternity photos. We did an outdoor maternity session per the mom's request. I posed them like I normally would for an engagement session. I love this photo because of the way the light is coming through the trees and hitting the green grass and back lighting the couple I also love that they are both holding the outfit and kissing. Along with outdoor maternity photos we can set up a studio shoot with a black backdrop and just you!